It’s interesting to see how many films that would normally feel like they should be one-off entertainments have transformed into long, convoluted sagas filled with their own complex and often contradictory histories and the habit of circling back on themselves in strange ways. This recent phenomenon seems primarily based in the horror genre, with Saw, Resident Evil, Underworld and Paranormal Activity springing to mind. 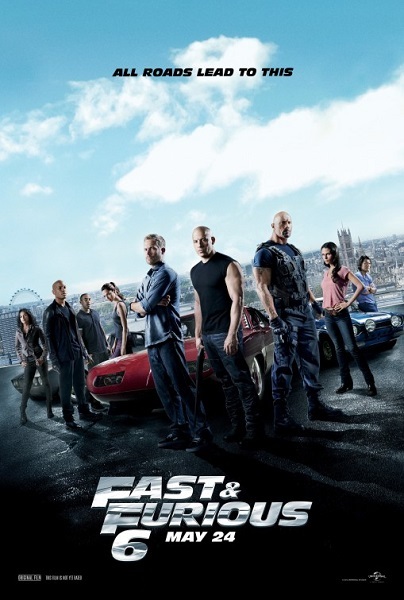 The best non-horror example and one franchise that seems to have happened upon the best way to keep itself moving is The Fast and the Furious. 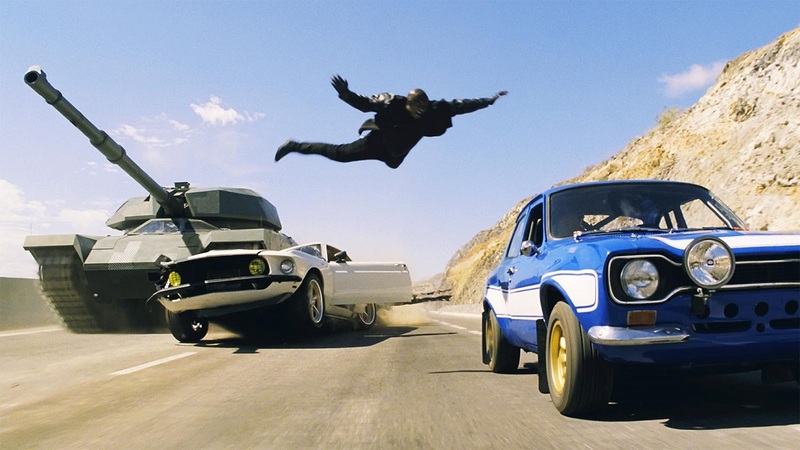 The original was a decent, surprisingly character-based crime flick with flashy cars and dour anti-heroes focusing on the relationship between naïve undercover cop Brian O’Conner (Paul Walker) and burly street racer Dominic Toretto (Vin Diesel). Two shaky sequels opened to diminishing returns, suggesting the customary decline of a franchise that was never intended to be one. And then something interesting happened: the series, to use an appropriate metaphor, cannibalized its earlier entries for parts and put them under the hood of something new. After the fourth film, which reunited Walker, Diesel and original female leads Jordana Brewster and Michelle Rodriguez to continue the original storyline, the fifth film collected all the supporting characters introduced throughout the seemingly peripheral sequels to form a makeshift family. The same entry also saw the series jump genres from flashy but standard crime film into Ocean’s Eleven-style heist film, a decision that allowed us to openly revel in the group’s larcenous activities. After the last film, Toretto and O’Conner had escaped the law and were enjoying the rewards of their last score, with O’Conner looking forward to enjoying parenthood alongside Toretto’s sister Mia (Brewster), expanding the family even more. But before long Luke Hobbs (Dwayne Johnson), the relentless Diplomatic Security Service agent who was tracking them last movie, shows up on Toretto’s doorstep seeking his help to take down Owen Shaw (Luke Evans), a former SAS agent and expert in mobile combat who’s pulling off a series of military heists. 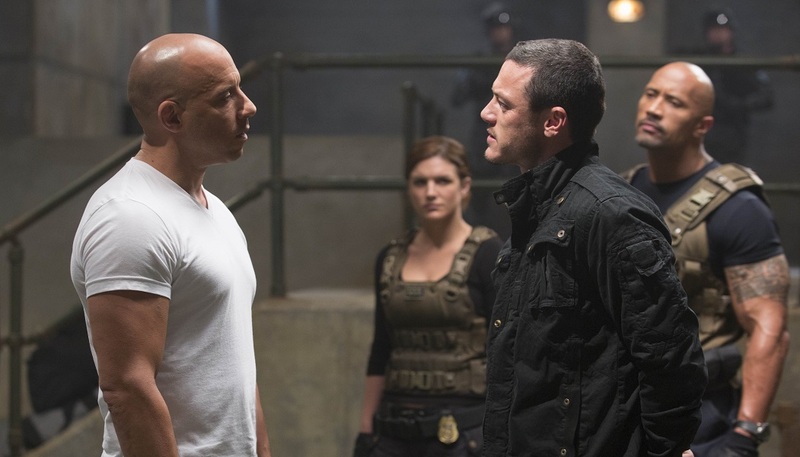 Hobbs has some strong incentive for Toretto and the team to get involved: it seems that Letty (Rodriguez), Toretto’s girlfriend who was apparently killed two films before, is helping Shaw. Motivated by the promise of full pardons for their past transgressions and the chance to bring Letty back into the fold, the gang speeds into action. The shift in genre brings some welcome novelty to the series, notably a change in location as the sun-soaked deserts and bright urban landscapes our characters have populated are traded for the chillier, muted colors of London, home of everyone’s favorite super-spy. Like Bond, Shaw uses various technical gadgets to pull off his schemes, while our heroes rise to the challenge by relying on the might of their visually-fetishized vehicles, allowing for an empowerment fantasy wherein motorheads can use their technical know-how and skills behind the wheel to elevate themselves from street criminals to epic heroes on the level of Bond, Ethan Hunt or Jason Bourne. The gang has their own strange little society based entirely around the automobile. Characters flirt with each other and argue through mechanized language and differences are settled through precision driving. One of the film’s most amusing moments has Hobbs and his newest partner (Gina Carano) sharing a bemused look as the family problem-solves through automotive jargon, regaining confidence after a crushing defeat by stepping back into their area of expertise. And like the Bond and Mission: Impossible films, the action scenes jump into outright fantasy. Up to this point, the series has blended great stunt driving with some sometimes dodgy computer-generated flash to offer thrills that managed to keep all four wheels on the ground... usually. As the stakes and carnage grow larger, whatever level of plausibility the films have been rooted in goes right out the window, with our heroes facing off against tanks and leaping back and forth between cars and cargo planes with little regard for physics or the limitations of the human body. But just as Sean Connery could make us accept the ridiculous with a wink and a nod, the film signals us pretty early on that you’re either going to accept and enjoy its tenuous grasp on reality or get left behind. One thing that is a bit frustrating is the film’s inability to allow what subtext it offers to remain beneath the surface. Shaw and his cold, clinical attitude toward his crew are quietly contrasted with Toretto and O’Conner’s family-oriented approach early on, making it really clunky when Shaw and Toretto have to verbalize this during their confrontations. Then there’s the way the doppleganger quality that Shaw’s forces possess in relation to our heroes is pointedly commented on. The thematic threads of the series involving family and ‘having a code’ are never allowed to be expressed through the story but must be brought up bluntly in conversations that no normal human being would ever have. Even in a silly action movie for the masses, it would behoove director Justin Lin and his screenwriters to give the audience a bit more credit. The returning cast has grown so numerous the film is spread thin trying to contain and serve them all, a problem compounded by bringing back a few more bit players from earlier entries. Still, it’s refreshing to see such an expansively multiracial cast in a blockbuster on this scale, particularly since it’s grown organically through the series and doesn’t seem like a case of writing minority characters to represent specific demographics. Walker and Diesel don’t bring anything particularly new to their roles, which is just as well since the film might burst from lack of room if they had. Sung Kang and Gal Gadot remain the most interesting of the core group as Han and Gisele, continuing the cool-headed chemistry of their romantic coupling. Tyrese Gibson’s obnoxiously motor-mouthed Roman remains a bit of a problem, especially since he doesn’t seem to serve much or a practical role in the gang other than giving Ludacris, consistently fun as the group’s technical wizard, someone to play off of. As the confused Letty, Rodriguez returns to scowl some more but for all the importance ascribed to bringing her back, she serves mostly as a device to point up the differences between Toretto and Shaw. Jordana Brewster is mostly sidelined in this adventure as Mia, but not as badly as Elsa Pataky’s Elena, whose potentially interesting relationship with Dominic is disappointingly cast aside for plot convenience. Meanwhile Dwayne Johnson ably fulfills the Brigadier role as the group’s friendly enemy, suggesting a quiet exasperation as he’s forced to join forces with this bunch. For newer cast members, Luke Evans is effectively menacing as Shaw, who feels like the first really threatening opponent our heroes have had to face in the series since, like them, his power comes from his ability to trick out his vehicles and operate them to devastating effect. He continues the recent, and welcome, trend of brilliant and calculating film villains and adds a smug confidence that makes us eager to see him defeated, which makes it all the more disappointing when the script undercuts his character by making him randomly sadistic and psychotic during the film’s biggest chase scene and failing to define his emotional connection to Letty. On the other side of the law is Carano, cementing the action heroine chops she showed off in Haywire through one of the film’s most exciting scenes, a messy, drag-out brawl with Letty through a London tube station. With a seventh film already in the pipeline (and set-up by a mid-credits sequence we’ll discuss in the SPOILER section below), it’ll be interesting to see just how far this series can go and what other genres our heroes might crash into. Will we get a film noir entry? How about a war film with the gang speeding through the site of some international conflict? Considering how much these movies have cribbed from Westerns, perhaps a full-on version of one of those is in order. Hell, maybe by the twelfth or thirteenth film we’ll see O’Conner, Toretto and company (which by then will no doubt reach thirty or forty characters) battling an alien invasion or cruising through a post-apocalyptic landscape. Until then, the Fast and the Furious continues to outrace its expiration date and provide a brawny, goofy joyride. Ok, SPOILER time. Only scroll on down if you've already seen the film or have no problems with having aspects of the plot and its ending revealed. There will be additional blank space to ensure you don't see anything you don't want to in case you just want to go leave a comment. Ok, our mid-credits stinger finally brings us back to the moment I’ve been dreading revisiting, the scene from the third film in which one of my favorites, Han, reaches his end in a street-racing crash. This fate has been looming over the character for the past three films as he keeps mentioning ‘going to Tokyo,’ so while the series will be lesser for his absence, it’s almost a relief to finally have done with it. But the retconning continues here as we see that Han didn’t just crash but was crashed into intentionally. As he lay injured in the wreckage, who should step out from the assaulting vehicle but… Jason Statham. While the content of the scene indicates that whoever he’s playing, he wants revenge for what happens to Shaw in this film (which as it plays out onscreen is ambiguous enough that I wouldn’t be surprised if that’s also retconned and he turns up alive in a future installment), for one glorious moment I thought it would turn out he was playing Frank Price again and this was hinting at a cross-over with the Transporter series. Ahh, how amazing that might have been.